Nicki and Meek flirted away on Instagram and a photo involving a hot tub and some champagne landed Beyoncé in hot water. 1. 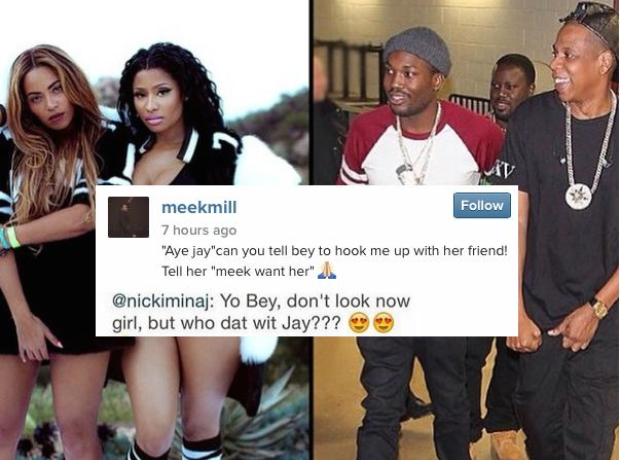 Nicki Minaj and Meek Mill did some funny flirting on Instagram. 2. Beyoncé shared some stills from the 'Feeling Myself' music video. 3. One of them, which showed her pouring away some expensive champagne, landed Beyoncé in hot water. 4. Lethal Bizzle's been trying his hand at Scrabble. Not sure if that counts, Biz. 5. Drake put the finishing touches to hip hop legend Bun B. 6. A$AP Rocky continued his Instagram murals, much to some followers's annoyance. 7. Chris Brown looked like he'd been on a big one last night. 8. Ciara cleared up rumours that her relationship with Russell Wilson was over by posting this photo. 9. Pharrell seemed busy at work on something. Is new music on the way? 10. North West turned into a butterfly for the day.